← Self Health/Help Book At Its Best! Looking for some fun, spooky Halloween terrors? Oops (shakes head), I mean stories to read? I was invited by Valerie Pinkerton Hemlin and Lynette Creswell (thanks ladies!) 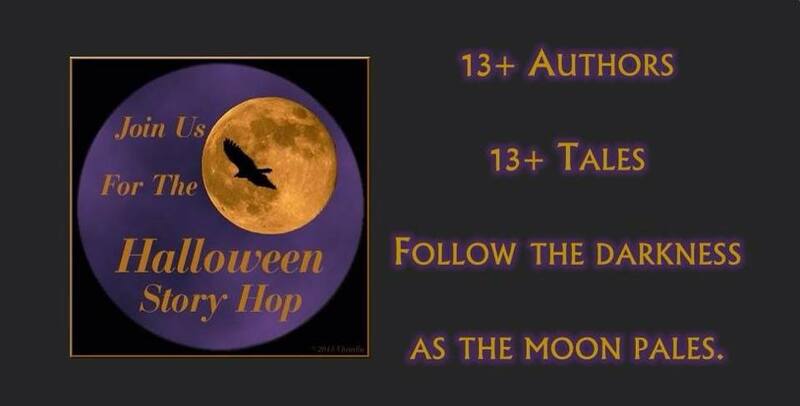 to join along in the Halloween Story Hop. Hope you have a frightfulicious time reading this season! To hop along and read more Halloween stories, click here and go back to Lynette’s blog! The dimly lit room of the abandoned colonial was awash with drifting dust the size of snowflakes, wafting along with the gentle breeze from a nearby window. Sophie tugged on her best friend, Paisley’s, hair, wrapping it in an exquisite braid that draped down to the dent in the middle of her back. “Owe! You pulled too hard,” Paisley cried, pulling forward in the antique chair away from her friend’s taunting fingers. Sophie softened her grip. “Careful now, Paisley dear, you wouldn’t want to break grandmother’s chair,” she said, mimicking Paisley’s stepmother’s shrilling voice. Both girls burst into a hale of laughter. “I wish you were real,” Paisley whispered, her sheer blue eyes glazed over, seeing only sodden looking gray spots before her. “I am real. You know I am.” Sophie pouted and thrust her hands on her hips. She placed her arctic fingers over Paisley’s eyes forcing them shut and massaged her eyelids. Paisley began to feel the familiar otherworldly warmth that sprang through them. She fluttered her eyes a few times, until they opened like window shades on a shimmering summer day. “Oh, it’s beautiful!” Paisley looked wide eyed. She stared at her glossy, auburn hair in the timeworn, full length mirror that stood before her. Paisley snatched the silky dress and placed it in front of her. She swayed her hips and hummed her favorite tune, Unchained Melody, by the Righteous Brothers. Paisley stopped, if only for a brief moment, letting her thoughts soar to a place she’d only dared to visit in her wildest dreams. Her thoughts of William, the most beautiful boy in the twelfth grade, with his lake blue eyes and blackened greased back hair, his shining smile that lit up the world, and a laugh that could erase an entity of pain. “It’s not a dream, Paisley,” William said. “I’m real, and I’m here, and I think you’re beautiful.” He tightened his arms around Paisley’s midriff, drawing her nearer to him. She could smell a hint of his cologne, along with spearmint breath from newly brushed teeth. The night was filled with an air of youthfulness: only 9:00 p.m., three more hours until the Halloween dance would end at midnight, the bewitching hour. Everything will turn back into a pumpkin or whatever, Paisley laughed to herself. Sophie walked up airily to Paisley with a cup of freshly made swirling punch in her hand. “Paisley, some punch? Or maybe for you, William?” she asked as she stared at William up and down and then intently up and down again, her eyes slit and uninviting, as if to say, Stay away. Paisley’s mine! The sound of music and drums thumped rhythmically in the background, in sync, like a witch’s enticing spell. Paisley’s head began to whirl, an exciting spin at first, one that made her heart flutter and pull William closer to her, but then her stomach flip flopped in a way that made her think she was hungry or sick, maybe. She was unsure. Paisley eyed the food table. Mr. Greene, the Principal, and one of many chaperones for the night, was standing there looking bored, though he wasn’t really. Mr. Greene was inadvertently watching William, the star quarterback, while William was dancing with the unknown Paisley. Odd, Mr. Greene thought. William must have brought her from some other school. Her clothes, hair, and make-up look out of date. She looked like a girl he’d known from his younger years. A chill rolled over his skin. It couldn’t be. The dead didn’t come back to life. Or did it? Mr. Greene had once been a popular football player himself, though not the quarterback. He’d been a linebacker, huge, muscular, and popular. His girlfriend, Patty, had had long, pretty dark-red hair. She’d been a cheerleader, and popular, from a troubled home, though you’d never know it. Her smile lit up the universe. Everyone wanted to be her friend, but then one day sickness coated every living cell in her body. She stayed away, at home, where her stepmother, Sophie, had imprisoned her. Doctors and tutors had been allowed to enter their home, but never friends and especially not a boyfriend. Tales of terror about Patty and her family were whispered and hushed in every school corner and on the streets of their little town. Then one day it was over. Rumor spread that Patty had died and her family moved away, leaving the old colonial empty and abandoned, a place no new homebuyer wanted to even take a glance at. Eventually, each Halloween night, school kids would dare to enter the grounds, though never inside, and had claimed they’d seen shining lights, heard angry voices, and a young girl screaming. Most people didn’t believe their stories, but still, visiting the old mansion had become an eerie Halloween ritual for local kids. Paisley pushed William away. Her thoughts went wild. If I had never given in, if I had fought the disease, if I had never listened to my stepmother, if, if, if. Maybe I would still be alive. You have to fight in life. Is it too late? Can I go back? Mr. Greene moved closer to William and the unusual girl he’d been dancing with. “Is anything the matter?” he asked, noticing that the girl’s eyes were darting about the room like a rabid animal. Startled, Paisley threw a penetrating stare at Mr. Greene. Her eyes grew wide with renewed recognition. She shook her head, the sound of the music soared, she buckled over. William, Mr. Greene, and Sophie stepped closer to her side. A sinister cackling could be heard, along with Paisley’s stepmother’s shrill voice in the background. All Paisley could hear in her head were chants. You can’t wear that preposterous dress, wear the one I bought you, let go, come to our side, do it! Paisley fought the chants. She battled the jeering in her head, then passed out. Paisley awoke to a dimly lit room, recently polished sparkling clean by the housekeeper. The renovated colonial squeaked when her husband neared the room, as though the home had a language of its own. Joshua, their son, a senior in high school and a sports star, bounded into the room. “Mom, Dad,” he called. “I”m going out with Patty for a movie. No trick or treating. We’re going to see The Shining. Have you heard of it? It’s from back in the day when you were young,” Joshua laughed. Paisley nodded to Joshua, uncertain as to why Halloween has always brought her chills of terror. She knew she’d feel better the next day, or at least until the following All Hallow’s Eve season. Then, the nightmares and illusions would regretfully return, and her mind would, once again, feel gripped with irrepressible insanity. Don’t forget, if you want more ghoulish treats click the link below to hop back to Lynette’s blog, and thanks for stopping by! This entry was posted in Uncategorized and tagged #halloween, All Hallows Eve, fun, Holidays, Scary. Bookmark the permalink. What a great story! So many layers! I loved it…and wanted so much more! Thank you! Thanks, Lynette! Very fun Halloween Hop! A crazy braid of complex characters in a short story. Good stuff. Thanks! I’m about to check out your piece:-) I started from the top and am going down the list. Happy Halloween! Ohhh, really enjoyed this one! Kept me hooked and guessing what was really going on, but the end really got me. Fantastic work! A fine piece of writing. Read it, it stayed with me, so I read it again! Thanks.